Extra Large Monument Style Address Plaque - - personalized business or residential address sign provides a large number format and is available with either a one line or two line address. Wall mount. Made in USA. 16" wide impressively large address sign for your home or business is custom made with the address you supply in the color combination you select. Swirl designs accentuate the notched arch top and all four corners. 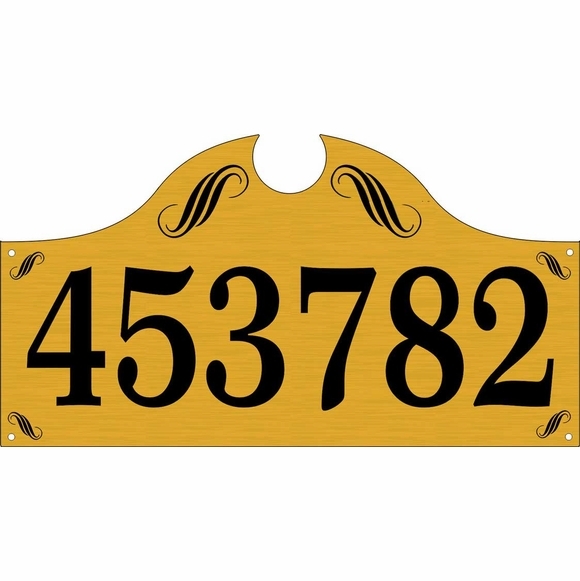 A one-line address sign holds up to six (6) 4" characters or four (4) 5" characters. A two-line sign holds up to five (5) 3" characters on Line 1 and thirteen (13) 1.5" characters on Line 2. Dimensions: 16"W x 8.6"H x 1/8". Other sizes available: can scale smaller or larger up to 36" wide. Please contact us with your requirements. Unique modified arch shape extra large address sign is especially suitable large wall spaces and larger homes.